We Are The World: You Wanna Join What?? We were taken by surprise when Marj said she wanted to join the high school band. We said, "But, you don't play an instrument." She said, "Mr. Forsten asked me to join, my friends are in it and it's fun." "But you don't play an instrument." "He can teach me the triangle." The triangle? In a pep band? 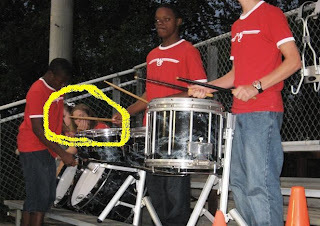 So we went to Friday night's first football game to see Marj in the band. We had a Marci sighting!!!!!! Welcome home, Marci, don't ever leave us again. i swear sometimes it's fun! and when u weren't looking, i pounded the bass drum. so booya mom.